Manhattan has suffered from global warming, and now part of the city lives under water. The poor reside there, in the Depths along with Mystics who have been banished. The rich live above water, in the city Aries, where they rule over those below them. Aria Rose wakes up from a coma being told that she is engaged to Thomas Foster, the son of her family's political oppositions. Their families have been in a feud for over many years but their union means the city will come together as one, to fight against those that dwell in the Depths. Except Aria doesn't remember anything that she has been told. In fact there's a large part of her memory missing. Then she meets Hunter, a secret Mystic, who helps her realise that her missing memory is not as innocent as she thought. Ok, so I don't think I've heard great reviews about this book. I can understand why now. 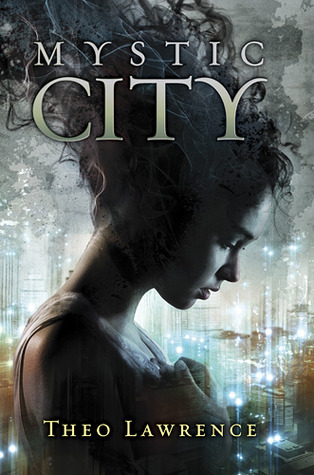 I usually do quite a lot of research before I buy a book but Mystic City was pretty much a cover buy despite knowing I might not enjoy it. It was just too pretty to ignore. The story itself wasn't terrible, it just wasn't exceptional. I found that the world building was solid though. It was easy to pick up which world I was in and how it was set up. Lawrence made use of the present Manhattan to build the foundation for his own world. The streets and places have the same names i.e., 5th Avenue etc and Central Park, but it evolved in an interesting way. I actually wouldn't mind living in a world as such, if not for the large gap of inequality and government tyranny. However, it did take me a bit to realise that it was set in the future, because of the speech used and roles each gender took. It was very much a patriarchal society, which I usually align with societies in the past. The use of Mystics means there are fantasy elements involved, however small. It was still interesting to read of each power a Mystic had. Also there were bits and pieces on inequality and fights for rights. Other than that, it was still a romance based around Aria and Hunter. Although I guess I did see that coming. I liked Lawrence's writing enough. This ties in with his world building, but there was quite a lot of detail in what was going on around the characters. I flinched at some parts and really did gasp out loud (I know, lame). There was enough suspense and surprise to pull me through. Other than that I just think the characters fell flat and the plot was nothing but predictable, for most of it. Aria was basically a damsel in distress, but with a bit more backbone. I sympathised with her because I knew she was struggling, but her recovery was every bit how I expected it to be. It wasn't what was going to happen next but how it was going to happen. Both Thomas and Hunter were very typical male characters. Thomas was the rich, haughty heir whilst Hunter was the gorgeous, misunderstood boy. You like Hunter because you have to and find Thomas annoying because he goes against your beliefs. There was definitely no attachments there. Unusually though, the minor characters had a bit more complexity, such as Aria's maid. The ending probably made up for the few issues I had with the story overall. A few twists and turns crop up, much to my displeasure. It also opens up for a good start for the sequel. I'm still unsure as to whether I'll continue with the series though. It was definitely a very easy read, which I think I wanted during that time. However, it was a little too dull for me. set for release next month. already out (I lied, it was published 8th April).